The best place to get forklift batteries in Alberta is Green Power Batteries. Well, known for great deals in brand new and refurbished batteries, Green Power Batteries leads the market place for forklift batteries. We do this by giving you the best price for both brand new and refurbished batteries. Our Refurbished batteries are fully tested to ensure that the productivity of your forklifts will always be to the highest standard. As an international company, we can provide various industrial forklift batteries throughout Alberta for the most popular models: Barrett, Blue Giant, CAT, Clark, Crown, Daewoo, Dockstocker, Drexel, Elwell-Parker, Hoist, Hyster, Jungheinrich, Komatsu, Linde, Mitsubishi, Nissan, Raymond, Schaeff, Schreck, TCM, Toyota, and Yale. GPB locates hard to find models and sizes. 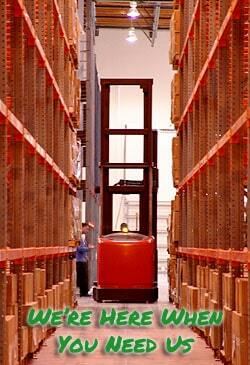 Green Power Batteries sells and services forklift batteries throughout Alberta. Most major forklift operators know to call us when they need a battery. GPB has an extensive stock of forklift batteries that are available in Alberta for all types and models of forklifts. If you cannot find the battery you are looking, give us a call or fill out our online form. GPB will locate and acquire the battery quickly and at the best price. All new forklift batteries come with a 7 year full warranty. 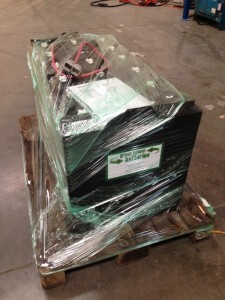 As well as selling forklift batteries in Alberta we also buy used forklift batteries. If you have a used forklift battery that is no more than 5 years old that you are looking to dispose of, then get in contact and we can take them off your hands. 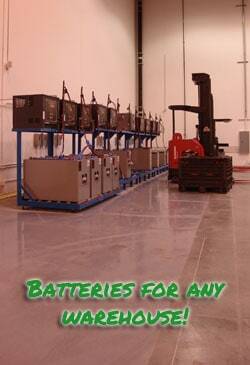 We are the world leaders at reconditioning used forklift batteries and we usually pay more than scrap price. Our refurbished forklift batteries are a minimum of 85% of the rated capacity of our new forklift batteries. Each battery comes with a standard 1 year or optional 2 year warranty. The batteries are refurbished to the highest degree of quality using our 18 step reconditioning process, making them the highest refurbished forklift battery available in Alberta. GPB in Alberta will buy and pick-up your used forklift batteries to recondition. If you have a battery that is starting to lose its capacity, contact us. 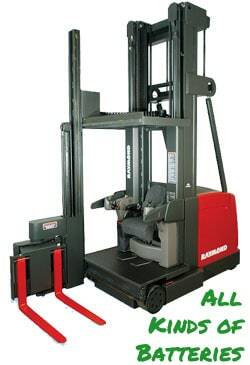 We are the world leaders at reconditioning used forklift batteries and in most cases pay more than scrap price. Reduce your cost and your carbon footprint at the same time by turning in your old battery and buying a reconditioned forklift battery. To purchase a new forklift battery or a refurbished forklift battery is simple. At the top of the page, click “Get a Quote” Fill out the form and choose the type of lift and model. We will get back to you shortly. No matter the make or model of your forklift, contact us for a battery. If we don’t have it, we will get it. For the best service, and easiest way to purchase a forklift battery in Alberta, Green Power Battery is the premier place to shop. Fill out our customer form below to get more savings. In Alberta a wide array of options to choose from when searching for industrial batteries and chargers for lift trucks and forklifts. It’s important to get the correct battery size, weight, and voltage that are compatible with your equipment specifications. GPB stands out among the other battery companies because of our environmentally friendly solutions, great product line and easy purchasing options. By specializing in refurbished or remanufactured industrial forklift batteries, Green Power Batteries (GPB) has carved out a special niche in the “green battery” landscape of Alberta by offering high quality forklift battery services. Fill out the form and we will get back to you right away. Thanks!